Track 02 : "Just Can't Wait" was first released as an instrumental on Eric Carr's "Rockology" album. Originally this very arranged song from 1987 was never finished with vocals. This song has been remastered using Eric Carr and Bruce Kulick's drum and guitar tracks. In addition Ted Poley (of Danger Danger) adds his vocals using lyrics written in 2006. Music written and performed by Eric Carr, Bruce Kulick and Adam Mitchell. Background vocals by Ted Poley and Mike Lodusma. Track 03 : "Troubles Inside You" : This is a complete demo taken from the original cassette tape (1987), featuring Mitch Weismann (Kiss co-writer, Beatlemania) on lead vocals. Mitch jokes about how he and Eric were at Gene Simmons house "just fooling around." Mitch wanted to try something different, so he sat inside a closet with his microphone and belted out this easy flowing song. In the meantime, Eric Carr programmed the drum machine, played some guitars, and added some background vocals. Written and performed by Eric Carr and Mitch Weissman. Track 05 : "No One's Messin' With You" : This song was discovered on an old DAT recording owned and made by Eric Carr in 1989. This alternative version of "Little Caesar", from the 1989 Kiss, album "Hot in the Shade" has an entirely different set of lyrics and vocal melody. Eric Carr handles the gritty vocals and bass guitar while Bruce Kulick fills it out with some rock-in'riffs. Since was an early demo this song contains no lead guitar tracks. Written and performed by Eric Carr and Bruce Kulick. Track 06 : "Carr Jam 1981" : remake / cover version of the Eric Carr song, by ZO2 members Benny Doro (guitars and bass) and Joey Cassata (drums). Track 08 : "Shandi" : In 2006 Eric Carr's "1980 KISS audition tape" surfaced. The tape featured an unknown Paul Caravello (Eric Carr) singing "Shandi". arrangement, make this update soar. Joining Eric Carr are some very talented artists whose contributions range from classical guitar rhythms to seductive background vocals. Words and Music by Paul Stanley / Vini Poncia; Lead vocals by Eric Carr. Guitar and percussion by Charles Sudiak; Keyboards by Benny Doro. Background vocals by Marcia Juell and Benny Doro. Track 09 : "All Hell's Breakin' Loose" : remake / cover version by ZO2. Track 10 : "Dial L For Love" : Written in 1987, this demo, was one step away from being complete. After so many years Kiss fans can finally hear this unreleased track. Music by Eric Carr and Adam Mitchell. Performed, by Eric Carr. Track 11 : "Elephant Man" : Eric Carr's last known composition. Carr wrote the lyrics for the song early 1991. Due to his untimely death, he would never complete it. In 2006, music was composed to complete this song. This song also reunites Eric with his family, as his sister Maria and niece Sara- Jean, pay tribute with their heartfelt background vocals. Lyrics by Eric Carr. Music composed by Nick Clements and Bob Gilmartin. Lead vocals, guitars and percussion by Bob Gilmartin. Bass by Marko Pukkila. Drums by AJ Pero (Twisted Sister); Intro lead guitar by Kee Marcello, ( Europe). Background vocals by Maria and Sara- Jean, Bob Gilmartin. Track 13 : "Midnite Stranger" : Ex- KISS guitarist Mark St. John contacted Eric Carr's family in 2006. Eric had given Mark a cassette tape containing a demo of a song that Eric Carr wrote called "Midnite Stranger". When Mark heard that there was a new Eric Carr CD in the works, he was eager to be part of it. Weeks before Mark's death he was in the process of creating some heavy guitar parts for the song. Sadly, Mark St. John pasted away in 2007, before he could complete them. This heavy rocker comes from that original 25 year old cassette tape (1986). Written and performed by Eric Carr. Additional mixing by Beth Jordan and Loretta Caravello. Track 14 : "Eyes Of Love" : Just like "Shandi" (track 08 on this disc), this version is build around Eric Carr's original lead and background vocal tracks of the original demo version of the song which appears on "Rockology". This new version is performed by Benny Doro and long-time Eric Carr admirer John Humphrey (Seether). Music and lyrics by Eric Carr, Bruce Kulick, Adam Mitchell. Lead and background vocals by Eric Carr. Guitars, bass, additional background vocals by Benny Doro. Drums by John Humphrey. Track 16 : "Through The Years" : Follow a young striving musician Paul Caravello as a 17 year old practicing drums in his basement becomes a master of his craft Eric Carr, drummer for the greatest band in the land, KISS ! Music written and performed by Eric Carr. Compiled, Edited and Engineered by Beth Jordan. Track 17 : "I Cry At Night" : Remixed and Remastered, written and performed by Paul Caravello (Eric Carr) with his first band, The Cellarman. Music. lyrics, lead vocals and drums by Paul Caravello (Eric Carr). David Bartky (bass); Robert Pryor (lead guitar); Victor Cohen (rhythm guitar). Track 03, 13, 16 and all interview segments: Recorded and Mixed by Beth Jordan for Amplified Studios. Mastered by Jon Santos for 1176 Studios. "Shandi" : Recorded and mixed by Charles Sedlak. "Elephant Man" : Recorded and mixed by Bob Gilmartin. "All Hell's Breakin Loose", "Carr Jam 1981" and "Elephant Man" : Recorded by Jon Santos. "Shandi", "Elephant Man", "Eyes Of Love" and "Carr Jam 1981" : additional recording and mixing by Benny Doro. "Eyes Of Love" : drum tracks Recorded by Paige Harwell at Sound Paige Studios. "Elephant Man" : drum tracks Recorded by Mark Altman and Rico Mancini at Coolmulti- media Studios. "Shandi" : background vocals Recorded by Marcia Juell. "Just Can't Wait" : additional recording and mixing by Danny Roselle. 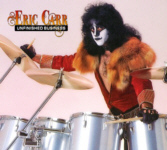 Eric Carr's interview segments : additional recordings provided by AJ Confessors.